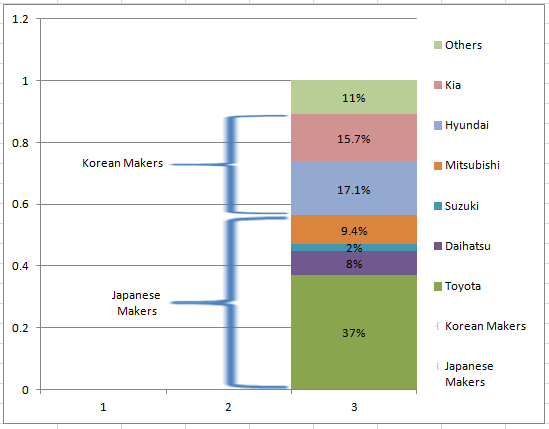 As you can see, the chart is grouped by the Japanese Auto Makers with a left curly bracket or as I like to call it a “Mustache” Bracket. 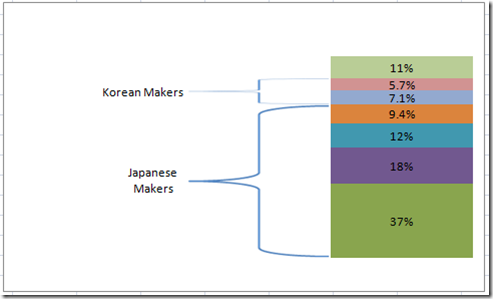 Also the chart has lines that match the column colors that extend to the legend values. 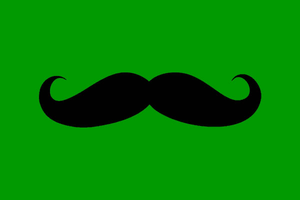 This tutorial will show you how to make the Mustache or Curly bracket grouping. Tune into the next tutorial to see how I created the lines matched to the legend values. So what a cool technique being able to group the values with a bracket. This will really help our executives focus on the parts of the dashboard chart that are the most important. 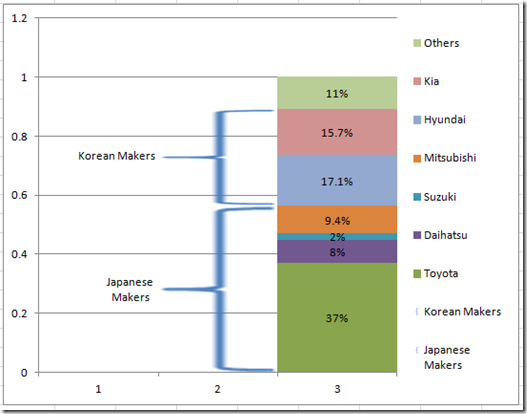 Here I have modified the Excel chart to highlight Japanese Auto Makers versus Korean Auto Makers with Mustache or Curly Brackets. 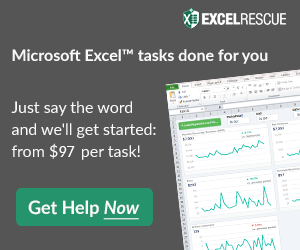 I think it can be an important Excel technique that is easy to create and does not need Excel Macros. 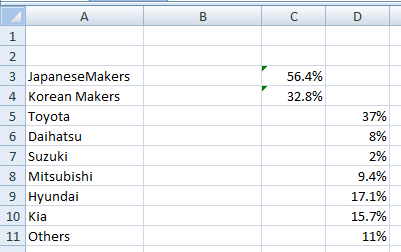 Also, as the values change the brackets will move to accommodate the change in values. 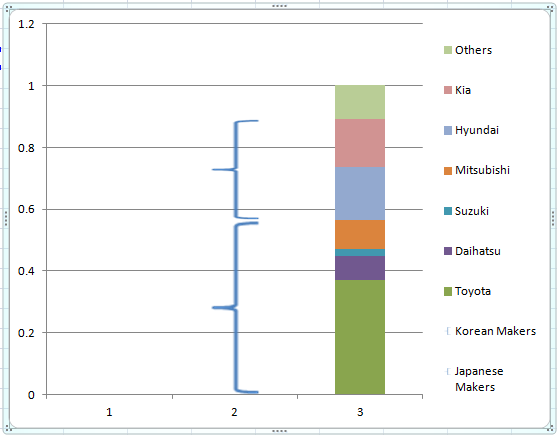 It can do this because it is not drawn over the chart, but actually part of the chart. 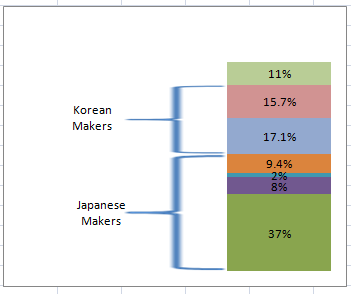 In this picture below, I have modified the data to make Korean percentages 20 percent bigger and Japanese percentages smaller by 20 percent. The chart updates itself and the curly brackets adjust accordingly. So lets see how I did this part of the infographic in Excel. 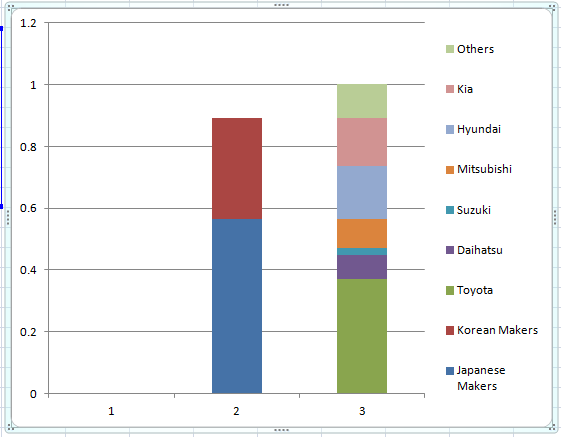 4) Copy and replace the column graphics with a custom marker/custom chart graphic. 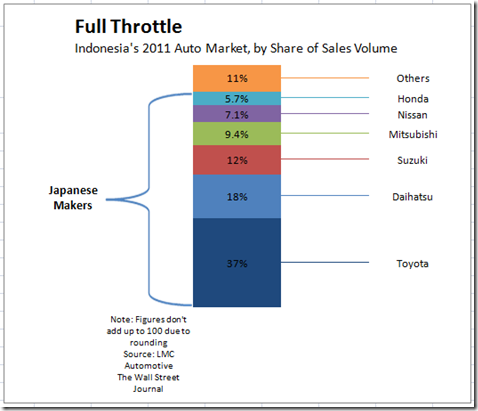 5) Close the Gap on the Chart columns. 7) Change the Bracket data labels to Series and remove Percentage. 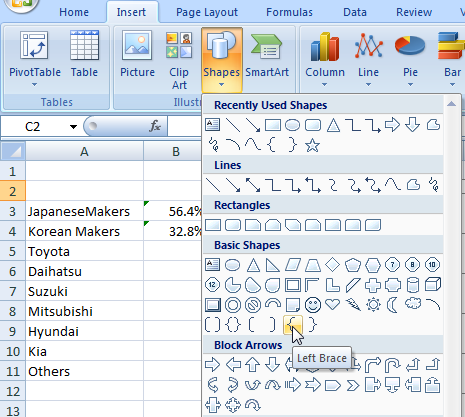 8) Move Data Labels for curly bracket/mustache graphics to the left. 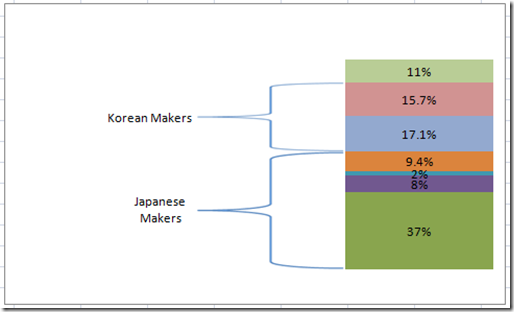 9) Clean up the chart junk. 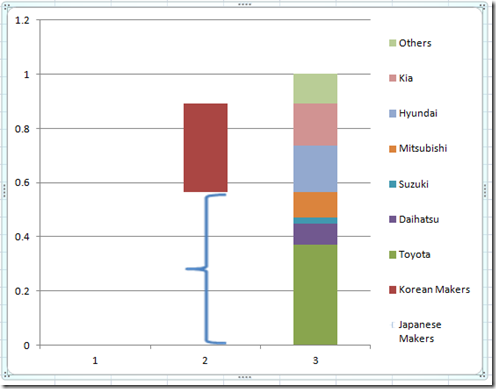 1) Setup your Excel chart data. 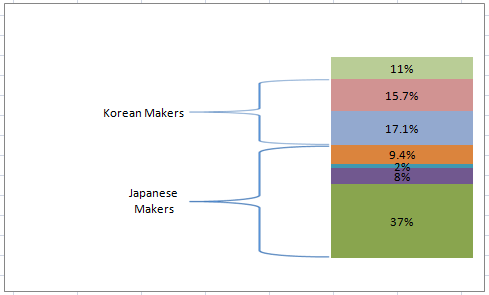 I set up the data into 3 different series like this. 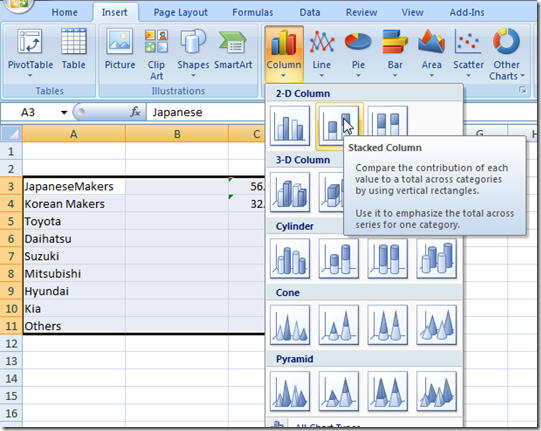 The blank series in column B will allow us some space for labels. 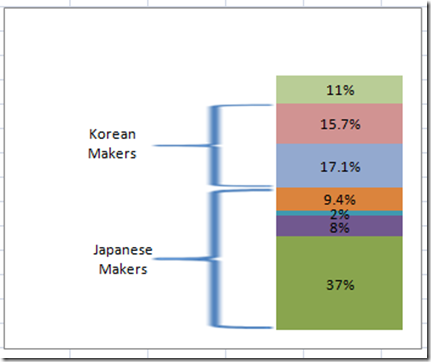 The formulas in Cells C3 and C4 are basic sum formulas that calculate the total percentage of Japanese (D5:D8) Auto Makers and total percentage of Korean (D9:D10) Auto Makers. but not a problem. 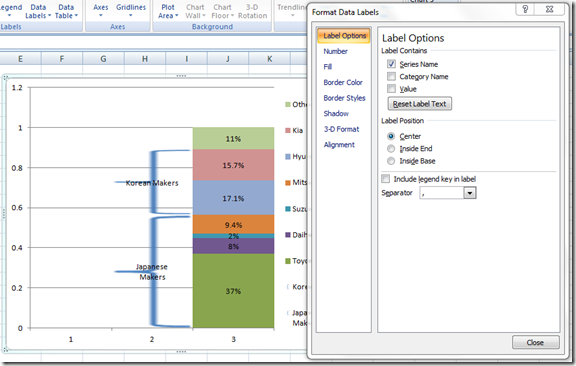 You must switch the chart data by clicking on the Switch Row/Column button in the Data group of the Design Ribbon. 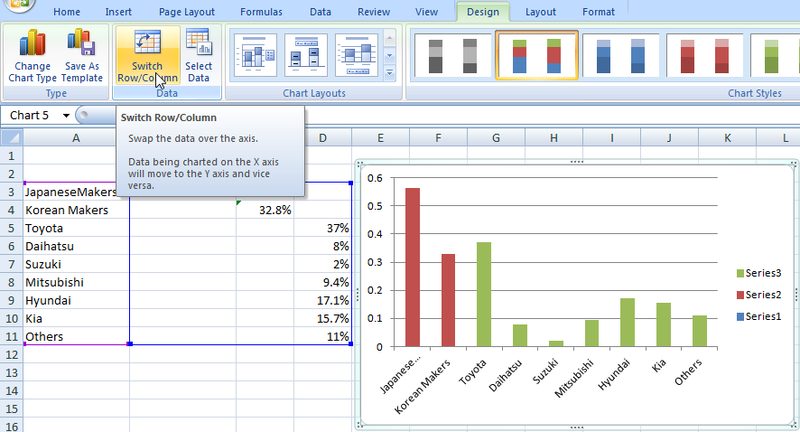 3) Insert a curly bracket graphic/Excel shape (Mustache Graphic) into the spreadsheet. 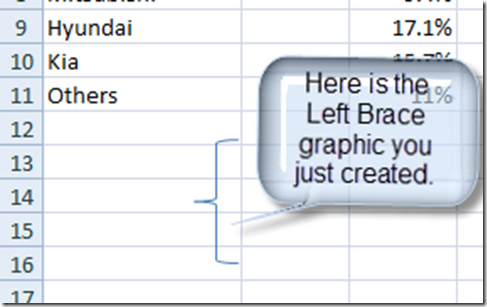 After you select the left brace from the menu, you need to go to your spreadsheet and drag and drop the shape about 1inch long. 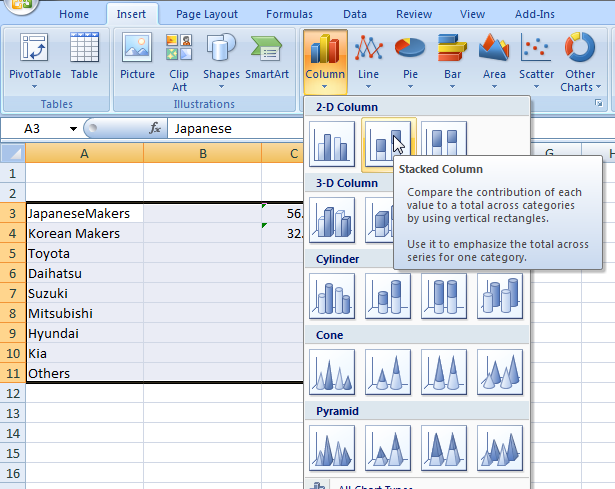 Your spreadsheet will now look like this with the shape. 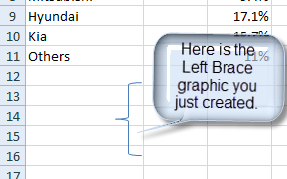 a) Now select the left brace graphic you just created and copy it. 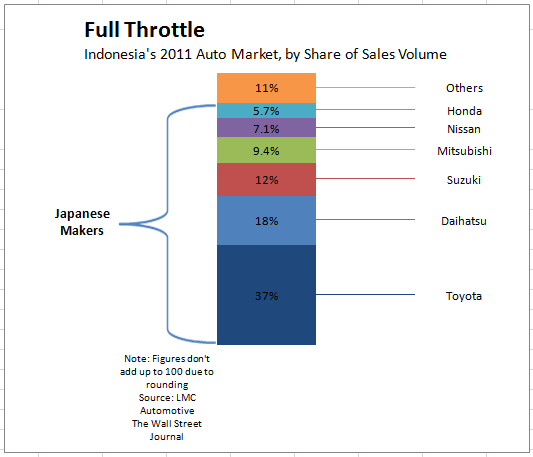 5) Close the Gap on the the Chart columns. 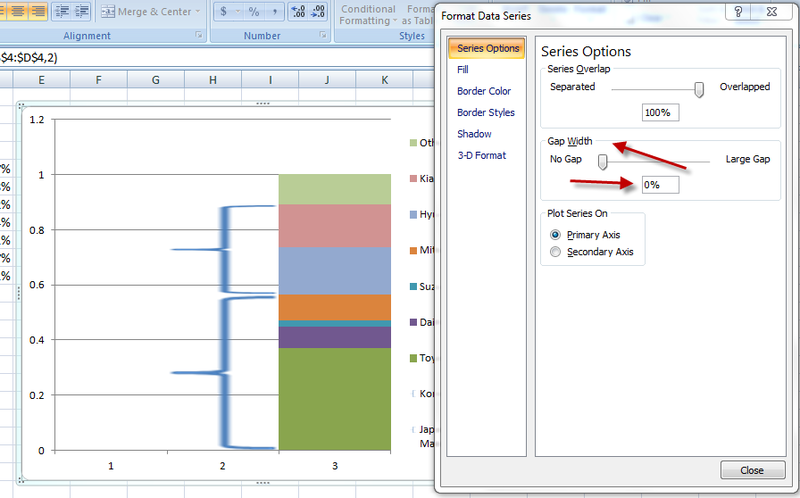 And change the Gap Width from the Format Data Series dialog box to NO GAP. 7) Change the data labels for the curly brackets / left brace groups to Series and remove Percentage data labels. The chart is looking pretty good. All we need to do now is clean up the chart junk. a) Select the legend and press the delete key. 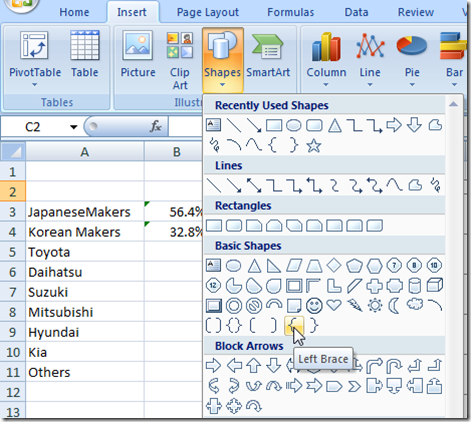 b) Select the horizontal grid lines and press the delete key. 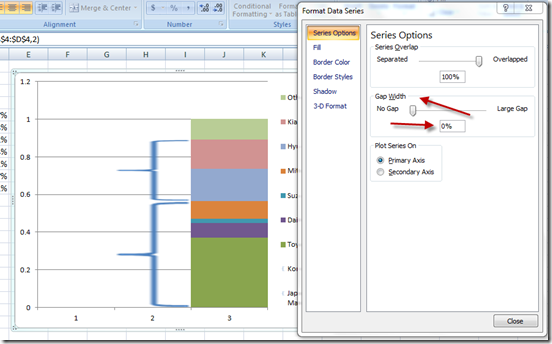 c) Select the horizontal axis and press the delete key. 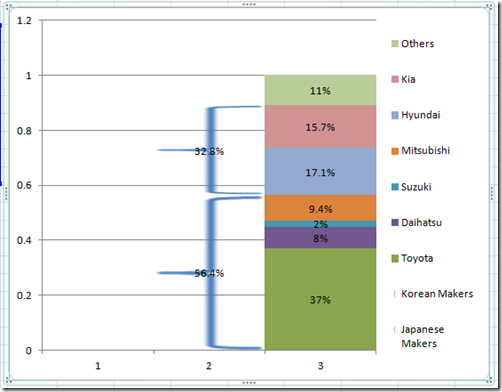 d) Select the vertical axis and press the delete key. 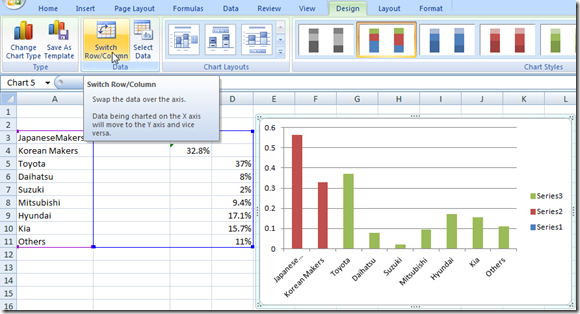 I think this is a really cool technique that you can use in any Excel Dashboard to highlight values in your Executive Dashboards. Stay tuned for the next post where we will complete the final formatting to get the full infographic that was shown at the top of the post. Thanks for visiting my blog regularly and be sure to sign up for the blog so that you are sure to get the latest charting techniques for Excel Charts.